PHOENIX, Ariz., Jan 31, 2018 (SEND2PRESS NEWSWIRE) — RestaurantOwner.com has released the report of their 2018 Independent Restaurant Outlook Survey. The report summarizes input gathered from over 880 independent restaurant owners and operators regarding their 2017 financial performance as well as their 2018 expectations. 2017 was a profitable year for independent restaurants. 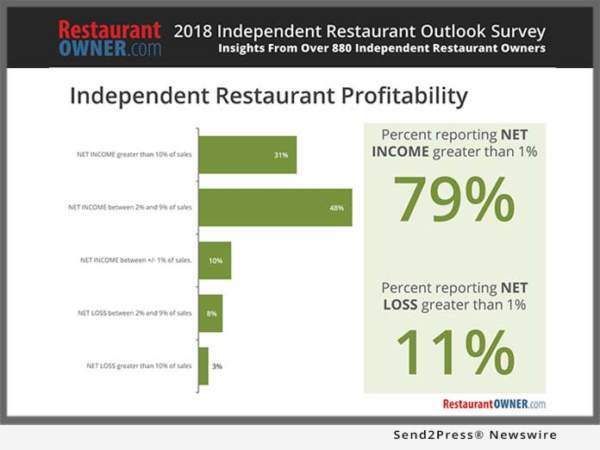 79% of the 882 responding independent restaurant owners or operators reported a net income greater than 1% of sales in 2017, of which, 31% reported a net income greater than 10%. Of those that were not profitable, approximately 10% broke even, while 11% reported a net loss greater than 1% of sales. 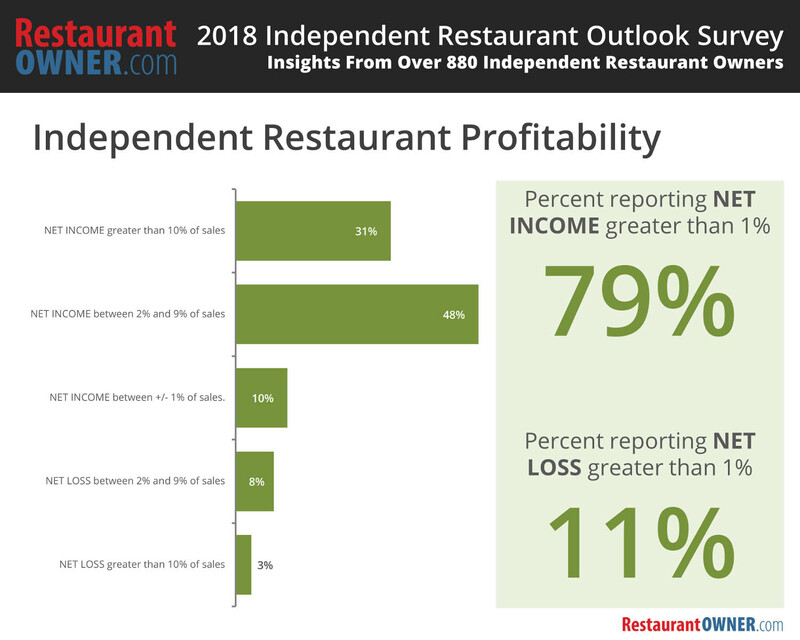 Profitability is on the rise as many independent restaurants performed better in 2017 than the previous year. 62% of respondents reported that their net income in 2017 outpaced their 2016 net income. Only 16% reported no change, and 22% reported lower net income in 2017 compared to 2016, indicating an overall upward trend in performance. Independent restaurant operators are optimistic about 2018, and their optimism is trending upward. 65% of respondents indicated they are more optimistic about 2018 than they were about 2017. This is up from last year’s survey results where only 56% of respondents felt more optimistic about 2017 compared to 2016. For operators who are optimistic, over half (68%) attributed their optimism to improved business practices or systems. Over half (61%) of those who are not optimistic attributed it to challenging labors costs. Independent restaurant operator goals reflect their optimism for 2018. Most (82%) identified four or more goals, indicating a desire to improve and grow in the new year. Over 50% of respondents reported they intend to focus on improving profitability, business practices, guest experience, or staff training, or that they are going to reduce their costs in 2018. Since 1998, RestaurantOwner.com has provided proven resources to independent restaurant owners and managers who want to improve their leadership and business management skills to create a more consistent, higher quality guest experience, greater employee engagement and better financial results.